Bert Gildart: Since its establishment in 1970, Earth Day has been celebrated 37 times, and with much justification. At the time of designation, I was serving as a school teacher in a logging community and I remember the enthusiasm with which the small town of Troy, Montana, rallied behind events the town had prepared. POLLUTION (Photo From Internet): Those were different times. It was a time when rivers caught fire and cities were hidden under dense clouds of smoke. Because of the status of our environment at the time over 20 million people celebrated the first Earth Day. Enthusiasm was great and though it has waned since those times, nevertheless our nation has made remarkable progress in protecting human health and safeguarding the natural environment. 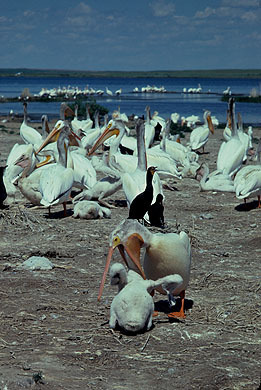 WHITE PELICANS: To help recall some success stories I’ve posted a few photos, and began with a picture of White Pelicans, a population which had suffered immensely from DDT. The chemical, as many recall, interacted with eggs—and weakened them to such an extent that when adults incubated them, they’d crush them. Rachael Carlson, of course, was one of the far thinking scientists of the times, who also happened to be extraordinarly talented as a writer, penning Silent Spring. She predicted such results. 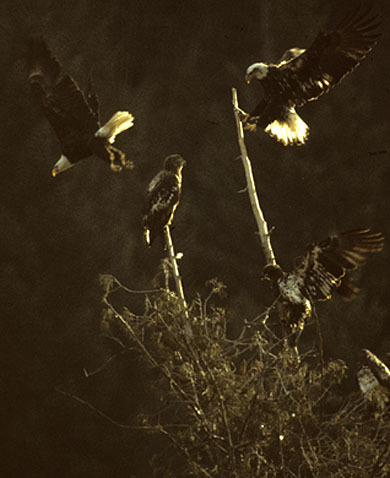 BALD EAGLES: Fortunately DDT was banned else in all probability other magnificent species as our American symbol would now be absent. The bird was placed on the Endangered Species list, but removed in 1996, an environmental success story. But it might not have happened without an Earth Day, which helped us all realize the need for an Environmental Protection Agency, created by President Richard Nixon. The agency helped eliminate the wide-spread use of DDT. 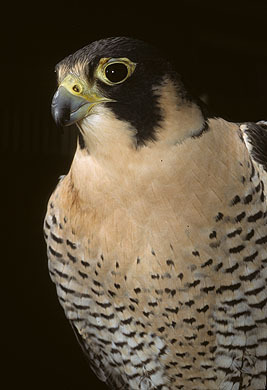 PEREGRINE FALCON: Another species once on the endangered species list was the Peregrine Falcon, but today, there are an estimated 1,650 breeding pairs in the United States and Canada. Other environmental achievement of the time include the 1970 Congressional amendment to the Clean Air Act, which set national air quality, auto emission, and anti-pollution standards. The following year Congress restricted the use of lead-based paint in residences and on cribs and toys. As well, in 1972 EPA baned DDT, a cancer-causing pesticide, and required extensive review of all pesticides. That same year the United States and Canada agree to clean up the Great Lakes, which contain 95 percent of America’s fresh water and supply drinking water for 25 million people. 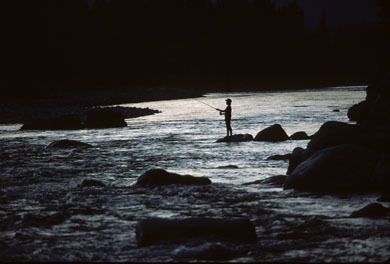 PURE FISHING STREAMS: There was also something in movements of the times for the sportsman and in 1972 Congress passed the Clean Water Act, limiting raw sewage and other pollutants flowing into rivers, lakes, and streams. We fishermen benefited for at the time only 36 percent of the nation’s assessed stream miles were safe for uses such as fishing and swimming. Today, about 60 percent are safe for such uses, so there’s still more work to do. Today, in view if the fact that we are facing what some consider a major crisis because of excessive green house gases spewed into the environment, it is interesting to contrast our success with our failures. We recall that over the past 37 years we have polluted the environment to such an extent that once the Cuyahoga Rivers caught fire. But we can also recall with pride that we have been able to remedy mistakes of the past. All it takes is commitment, and once we proved that we had it and that the result was Earth Day. This entry was posted on Sunday, April 22nd, 2007 at 7:00 pm and is filed under Natural History/Conservation, View Point. You can follow any responses to this entry through the RSS 2.0 feed. You can leave a response, or trackback from your own site.